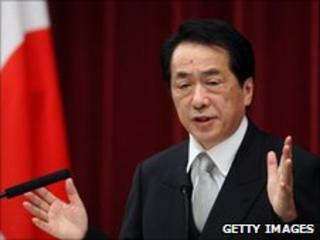 Image caption New premier Naoto Kan warned that Japan must change or face "collapse"
Japan is at "risk of collapse" under its huge debt mountain, the country's new prime minister has said. "Our country's outstanding public debt is huge... our public finances have become the worst of any developed country," he said. Pessimists have long warned that rising debt and a falling population mean Japan is headed for a point of no return. For 20 years the government has been borrowing to spend, hoping to revive the stagnant economy, amassing the biggest debt-to-GDP ratio in the industrialised world. The Japanese themselves have been buying those bonds at low interest rates. But as Japan ages, the thinking goes, households will save less. The Government will have to look abroad to borrow, and the higher interest rates demanded could tip the world's second biggest economy into the abyss. Now the new Prime Minister Naoto Kan has stepped into the debate in his first policy speech to the Diet, warning Japan could face similar debt problems to Europe. But not everyone is convinced Japan, with its huge trade surplus, is doomed. And Mr Kan may simply be easing the way towards raising consumption tax and reneging on spending pledges made during last year's election. Despite the prime minister's hair-raising words, markets did not bat an eyelid, with the Japanese yen, the Nikkei stock market index and Japanese government bonds unmoved. The Japanese government is effectively the only borrower in Japan, and raises all of the money it needs from the savings of its own citizens. Mr Kan did not detail the fiscal changes he may impose to revive Japan's economy after years to stagnation. But in the past Mr Kan has advocated increasing Japan's sales tax, a move that would be unpopular. He said: "It is unavoidable to launch a full reform of the tax system. If we maintain the current level of issuance of new bonds, outstanding debt will surpass 200% of GDP in a few years. "It's been 20 years since the collapse of the bubble economy in the early 1990s. Because the Japanese economy had been in the doldrums, people have lost the trust they had and fear the uncertainty of the future," he said. The Japanese austerity plans may not be welcome elsewhere in the world. Over the weekend, US Treasury Secretary Timothy Geithner called on surplus countries - like Japan, Germany and China - to do more to increase spending. Yet Germany has announced plans to cut its budget deficit by 3% of GDP over the next four years, while China's trade surplus has grown even further, according to data for May. With Japan also now looking to wield the fiscal axe, some may wonder who is actually going to spend money in the world economy.